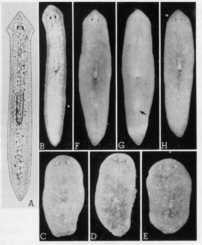 Sasaki's short web article entitled "Planarian found in tropical fish tanks at my home" (in Japanese) was opened in the beginning of 1999 as one of webpages of the "Gen-yu's Files". 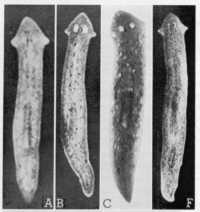 At that time, I had only a single Japanese publication on freshwater planarians found in tropical fish tanks: Kawakatsu and Hirai (1969: Reference 10). Recently, I got copies of many papers on this topic by contacting Dr. M. Kawakatsu. Thus, the above-mentioned web article was revised thoroughly based upon the latest data (http://www2u.biglobe.ne.jp/~gen-yu/tankpla.html). I have also prepared this English version under the supervision of Dr. Kawakatsu. According to recent publications listed in the "References", a total of 3 freshwater planarian species is reported from aquaria for tropical fishes and some ponds on exotic fish farms in various areas of Japan. These 3 triclad species belong to 2 infraorders, 2 families, and 3 genera (see the section "Taxonomy of the three species"). The photographic figures and idiograms of triclads in this web article were reproduced from the paper by Kawakatsu et al. (1985, 1986, 1993, 1995: References 1, 3, 4, and 5; see also Kawakatsu, 1994). For each species, a Japanese name in the Roman alphabet is also given (see Grygier, 1993). A: A sketch of a live specimen (Sapporo population). B: A photo of a live specimen (Ni'igata population). C-E: Preserved specimens (Ni'igata population). F-H: Preserved specimens (Inokashira population in Tokyo). G is the ventral view of the specimen F (an arrow indicates the genital pore). After References 5, 9 and 10. Living specimens of this rather small to middle-sized, dugesiid species are 10 to 12 mm long and 1.5mm wide. The head is of a subtriangular form with a pair of bluntly pointed auricles; two eyes, each surrounded by a clear non-pigmented area, are conspicuous. The ground color of the dorsal surface of the body is uniform pale brown with numerous, small, whitish spots. Non-sexual specimens of this species recorded from the indoor tanks for tropical fish culture at the Ni'igata City Aquarium in 1970 were at first erroneously identified as "Dugesia tigrina?" (Kawakatsu and Hirai, 1968; Hirao et al., 1970: Reference 9). In 1985, the animal was described as a new species based upon sexual specimens: Dugesia austroasiatica (see Kawakatsu et al., 1985: Reference 5). 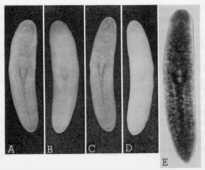 Chromosomal analysis and the karyotype of D. austroasiatica were studied by Kawakatsu et al., 1986 (Reference 4). A Japanese name for this exotic species was given by Kawakatsu (1998). Sapporo (in 1968), Ni'igata (in 1970), Tokyo (in 1972), and Saga (in 1984). No field population of Dugesia austroasiatica is known. The original locality of D. austroasiatica seems to be in Southeast Asia (Reference 5). A: An asexual specimen (Yokohama population). B and C: Two asexual specimens (Nagoya population). The right-side photo (F): A sexual specimen from Brazil (18 mm long and 3 mm wide). During the past 20 years in Japan, this North American dugesiid species has been recorded from indoor tanks for tropical fishes (in Yokohama and Nagoya) and an outdoor culture pond for Australian crayfish culture (in Kagoshima) (see References 2, 3, 5 and 6). The first naturalized population of this species was found in the Urakami River, Nagasaki City in Kyushu (Kawakatsu et al., 1993: Reference 3). Living, sexual specimens of G. tigrina from many localities in North and South America are a middle-sized (see References 3, 6-8, 12). In Japan, however, only non-sexual, small-sized specimens has been recorded (see References 2, 3 and 6). Living non-sexual specimens measure 8 to 10 mm long and 1mm wide. The head is of an equilateral triangular form with rather broad, short auricle. A pigment-free auricular sensory organ is visible on each auricle. Two eyes, each surrounded by a very conspicuous, large, non-pigmented area, are present at the level of auricles (the distance between them is one-sixth the width of the head). The ground color of the dorsal surface is pale brown with numerous whitish pigment spots. The ventral side is pale gray with numerous, small, somewhat dark-colored pigments. The pharynx is inserted slightly posterior to the middle of the body. It is a white, muscular organ of a cylindrical form; its surface is covered with pale, grayish pigments. This is an important taxonomic character of the Girardia species distributed in North, Central and South America. The pharyngeal pigmentation has not been observed in Dugesia species from Asia and Europe. Girardia tigrina is now considered as a cosmopolitan species. The animal has been introduced artificially into many countries of the world. Its naturalized populations have been reported by many researches (see References 2, 3, 5-8, 10 and 12). The distribution records in Japan of this American species has already been mentioned above. Additionally, G. tigrina has been frequently mentioned in previous literature as "Dugesia tigrina". Rhodax? sp. Living (A-D) and preserved (E) specimens from the Nagoya population. A: dorsal view; B: ventral view of the same specimen. C: dorsal view; D: ventral view of the same specimen. Photos of 2 live and 2 preserved specimens from the Sapporo population are shown in fig. 1 (A-I) on page 65 of a paper by Kawakatsu et al. (1995: Reference 1). In July of 1982, non-sexual specimens of Rhodax? sp. were collected from indoor tanks for tropical fish culture in the Biological Laboratory, Faculty of Science, Nagoya University, Nagoya (Kawakatsu et al., 1985: Reference 5). In October of 1993, many non-sexual specimens of the same species were also collected from an aquarium of a local tropical fish store in Sapporo, Hokkaido (Kawakatsu et al., 1995: Reference 1). Non-sexual specimens in life are 3-5 mm long and 0.4-0.5 mm wide. The head is of a rounded shape with a gentle swelling on either side; in creeping animals the anterior end formes a slight obtuse protrusion. Two eyes are situated on the dorsal side of the head at a somewhat posterior level (the distance between them is about one-sixth of the head). The bodies of small specimens are translucent or milky white. Larger specimens show a pale brown coloration on the dorsal surface of the body; small brownish pigments occur in the pharyngeal region. Rhodax? sp. has been recorded only from tropical fish aquaria in Japan. Chromosome numbers, karyotypes and idiograms of 3 exotic species of freshwater planarian mentioned in this web article are as follows. Notice a pair of subtelocentric chromosomes (Reference 4). A: Yokohama population; B: Nagoya population (Reference 5). Two idiograms of this species from the Nagasaki population are shown in fig. 3 on page 31 of a paper by Kawakatsu et al. (1993: Reference 3). A and B were found in the body of a single specimen (Reference 1). Additionally, the chromosomes of a Brazilian species, Rhodax evelinae Marcus, 1946, are not known. This is the only species in the genus Rhodax. According to the latest classification system of planarians (s.l.) proposed by Dr. Sluys (1990: Reference 13), the suborder Tricladida consists of 4 infraorders: Paludicola (freshwater planarians), Cavernicola (another group of freshwater planarians), Maricola (marine planarians), and Terricola (land planarians). In these taxonomic groups, many families, subfamilies, genera, and subgenera are included. The 3 species in the 3 genera mentioned in this web article are shown by bold letters in the following list. Note. For the identification of planarians by specialists of this animal group, a microscopic examination of serial sections of fully sexually mature specimens is necessary. Much of this work was suggested by Dr. Masaharu Kawakatsu (Sapporo, Japan), to whom I own thanks for his deep interest and excellent help. I am also indebted to Dr. Robert W. Mitchell (Bandera, Texas, U.S.A.) for his kind reading and careful corrections of the final English draft. KAWAKATSU, M., TAMURA, S., OKI, I., TAKAI, M. and FROEHLICH, E. M. 1995. The second record of occurrence of Rhodax ? sp. in tanks of tropical fishes in Japan (Turbellaria, Seriata, Tricladida, Cavernicola). Bull. Fuji Women's College, (33), Ser. II: 63-70. KAWAKATSU, M., TAMURA, S., TAKAI, M., YAMAMOTO, K., UENO, R. and OKI, I. 1993. The first record of occurrence of a naturalized population of Dugesia tigrina (Girard, 1850) at Nagasaki, Kyushu, Japan (Turbellaria: Tricladida: Paludicola). Bull. Biogeogr. Soc. Japan, 48 (2): 28-34. KAWAKATSU, M., TAKAI, M., OKI, I., TAMURA, S. and AOYAGI, M. 1986. A note on an introduced species of freshwater planarian, Dugesia austroasiatica Kawakatsu, 1985, collected from culture ponds of Tirapia mossambica in Saga City, Kyushu, Japan (Turbellaria, Tricladida, Paludicola). Bull. Fuji Women's College, (24), Ser. II: 87-94. KAWAKATSU, M., OKI, I., TAMURA, S. and YAMAYOSHI, T. 1985. Reexamination of freshwater planarians found in tanks of tropical fishes in Japan, with a description of a new species, Dugesia austoasiatica sp. nov. (Turbellaria; Tricladida; Paludicola). Bull. Biogeogr. Soc. Japan, 40 (1): 1-19. TAMURA, S., OKI, I., KAWAKATSU, M., NINAGAWA, M., MATSUSATO, T. and SUZUKI, H. 1985. A note on an introduced species of freshwater planarian, Dugesia tigrina (Girard, 1850), found in culture ponds of Australian crayfish in Kagoshima Prefecture, Japan. Bull. Fuji Women's College, (23), Ser. II: 133-137. KAWAKATSU, M. and MITCHELL, R.W. 1981. A note on the morphology of Dugesia tigrina (Girard, 1850) from Louisiana, U.S.A. (Turbellaria, Tricladida, Paludicola). Proc. Jap. Soc. Syst. Zool., (20): 1-6 + pl.1. KAWAKATSU, M., OKI, I., TAMURA, S., YAMAYOSHI, T., HAUSER, J. and FRIEDRICH, S.M.G. 1981. Morphological, karyological and taxonomic studies of freshwater planarians from South Brazil. II. Dugesia tigrina (Girard, 1850) (Turbellaria, Tricladida, Paludicola). Bull. Fuji Women's College, (19), Ser. II: 113-136. KAWAKATSU, M. and PONCE de LEON, R. 1990. The occurrence of Dugesia tigrina (Girard, 1850) (Turbellaria: Tricladida: Paludicola) in Uruguay. Proc. Jap. Soc. Syst. Zool., (41): 5-14. SLUYS, R. (1990). A monograph of the Dimarcusidae (Platyhelminthes, Seriata, Tricladida). Zool. Scripta, 19 (1): 13-29. GRYGIER, M. J. 1993. Japanese zoological nomenclature. Amer. Assn. Zool. Nomenclature, Sept. 1993: 5-8. See also Index of Planarian pages in "Gen-yu's Files".